Has Canadian PLE made good use of the Internet? Ever since the emergence and popularization of the World Wide Web in the 1990s, the Internet has been a central medium for delivering public legal education. But have PLE organizations made the most of it? Lois Gander, who has been tutoring me in the ways of PLE, is in the process of revising her 2002 paper, Applications of the Internet for Public Legal Education [204 KB MSWord DOC]. That document strives to catalog the most promising and curious uses of the Internet for PLE: for delivering it, for running the operations of groups that provide it, and for developing the professionals who oversee it. I’m going to use this post to spotlight some of the newer and innovative uses I’ve seen. Don’t dare take my word for it, though: point out your own examples in the comments! Forums for intermediaries and the public: good examples are the Community Law School (Forest, ON) forums (for the public) and the PovNet discussion lists (private, for advocates only). These allow groups to (1) foster collaboration, (2) maintain a presence, and (3) solve the “update problems” of PLE. Online courses: Povnet provides them on their “PovnetU” site; Éducaloi has online training for intermediaries as part of its À bon port program. Video games: I only know of one PLE video game available on the web—Éducaloi’s “Face-Off.” Are there others? Animation: the Law Courts Education Society has put together a whole site of animation segments, legalrights4u.ca; Éducaloi also has animation on the web: BOM-343. Interactive learning experiences: two memorable examples are the Law Courts Education Society’s “Kid’s Guide to Separation and Divorce” and “Try Judging,” which apparently was not produced by a PLE organization. Online forms: maybe not as flashy as some of the other applications, but worth noting. PLEA in Saskatchewan uses forms to recruit volunteers, and the People’s Law School in BC uses them to solicit requests for its speakers bureau. Materials clearinghouse: CLEO uses online forms well, too, on its CLEONet site, but the big story there is the site itself—an online repository of hundreds of PLE materials from organizations all over Ontario. Also note CLEONet’s participation in a “Constellation” of organizations that share content and events announcements over the Internet. Major web strategies: finally, I’d be irresponsible if I didn’t point out some of the most substantial uses of a website to do PLE. The web is at the center of Éducaloi’s delivery strategy, and its website is immense and features timely legal stories, tests, and polls. The Legal Studies Program at the University of Alberta (soon to become the Legal Resource Centre) has developed a number of large PLE websites, such as Laws for Landlords and Tenants in Alberta and ACJNet. UPDATE: The Legal Services Society of BC‘s recently relaunched Family Law in BC website is also extensive and well worth a look. Again, I know I’ve left good examples out. Please fill the gaps with your comments. Cultural and minority media placement: programs like the Cultural Minorities Program at the People’s Law School and the new Six Languages Project at CLEO place PLE content in newspapers and on radio stations that target specific minority (and often non-English-speaking) communities. Public access shows: in the past, PLE organizations from many parts of the country produced instructional TV shows—and sometimes hosted live TV talk shows—for broadcast on public access and educational channels. Promotion: several PLE organizations issue press releases promoting their programs and organizations. Éducaloi is a notable leader in this area and has attracted significant media coverage. Even though all three of these mass media strategies may be important, I and others still wonder why PLE organizations have not gone for the heart of the beast. Why not find ways to deliver PLE through the most popular media outlets and programs? To paraphrase what one observer told me: PLE organizations have trouble getting their message across because of all the “background noise” of popular media—there’s a competition for the public’s attention, and PLE organizations just don’t have the resources to compete with Ally McBeal. Supreme Court Preview: this is a periodical published monthly during the U.S. Supreme Court’s annual term. It’s targeted at the reporters who cover the Court, and last I heard it was the only external material distributed by the Court’s press office. The Silver Gavel Awards: an annual slate of awards given to mass media creators who get the law right and build public understanding of the justice system. Both programs are intermediary PLE. Both have an end result, presumably, of improving the accuracy of legal depictions in the mass media. Are ideas like this on the radar of Canadian PLE programmers? The line (if there is one) between “legal advice” and “legal information” is a troubling one to some public legal education providers, sole-purpose PLE providers (SPPLE) in Canada in particular. Though most Canadian SPPLE organizations have lawyers or lapsed lawyers on staff, only a few consider themselves engaged in the practice of law, and none confess an intent to provide legal advice. Thus, SPPLE programming—one-on-one programs like legal information hotlines especially—often rests right up against the advice/info line. Overconfident users: those who use PLE services might not realize that legal information is not enough in their situation, and that they need legal advice or representation. Unauthorized practice: those who provide PLE could get in trouble for invading the legal profession’s monopoly over legal advice. The unauthorized practice concern, although it can loom in a staffperson’s mind and has come up again and again as a reason for official tentativeness towards PLE, has not turned out to be a real day-to-day threat to PLE in Canada. * That’s a damn good thing, too, because nobody really knows exactly what “legal advice” is. The advice vs. information issue is one that many folks have tackled (legal scholars, law librarians, bar personnel, court administrators, and self-represented litigant support program task forces, to name the major groups), but that no one has pinned down. A common solution is to offer guidelines to information providers in the form of “what you can do” and “what you can’t do” lists [consider the set of deliverables from the Arizona Supreme Court’s recent study of the issue, discussed on the Self-Help Law ExPress blog [link]]. The overconfident users concern doesn’t come up a lot, although it’s probably the more serious of the two. Maybe the reason that this doesn’t loom in the minds of PLE staff is that many PLE users have no choice but to be overconfident. Legal aid is just not robust enough to offer legal advice to all those who need it but can’t afford it. The extreme interest lately in self-represented litigant support projects suggests that governments and the legal profession might be starting to see “overconfidence” as a solution to unequal justice—a solution that’s cheaper and less controversial than bolstering legal aid. There aren’t very many sole-purpose PLE organizations in Canada that have advice/info guidelines. Some probably do give out “legal advice” every once in a while—but hardly ever in a way that interferes with the legal profession’s monopoly. Is this issue just a straw man, a red herring, and a mountain made out of a molehill? * In the United States the story has been a little different, and a couple for-profit PLE outfits have suffered close scrutiny from bar associations [link; link]; plus, a recent Federal Court of Appeals ruling held that the seller of bankruptcy form assembly software was engaged in unauthorized practice [link]. Motivated by the healthy debate in the comments to my “Neutrality” and PLE post, I spent some time this morning looking for “biased” PLE content. And now I’m wondering if this debate is all theory and no practice—I don’t see much of a difference between the “impartial” providers and the “advocacy”-oriented groups. I sampled content from two PLE organizations that make a point of staying neutral (the People’s Law School and Éducaloi) and from three associated with an advocacy approach (CLEO, LSS, and TRAC). I hoped to spotlight some illustrative excerpts in this post, but I couldn’t find any. Can anyone offer some recent examples of obviously “biased” or “neutral” PLE content? 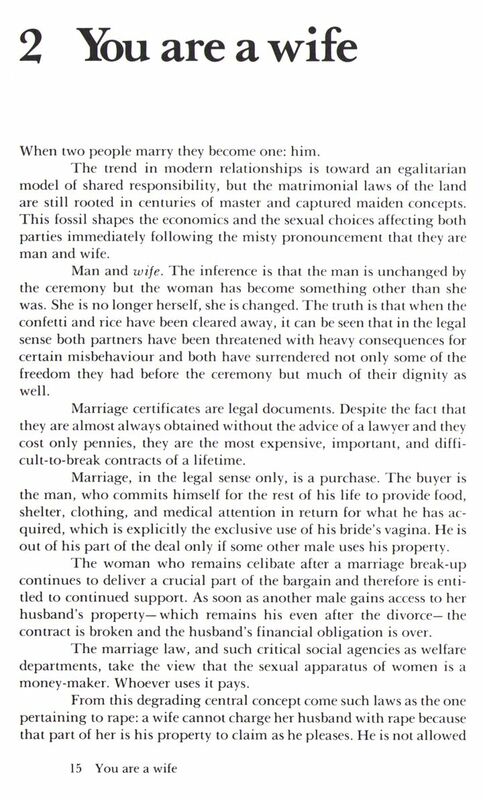 Above: a page from The Law is Not for Women: A Legal Handbook for Women (1976) by Marvin Zuker and June Callwood. Click on the image to enlarge it. 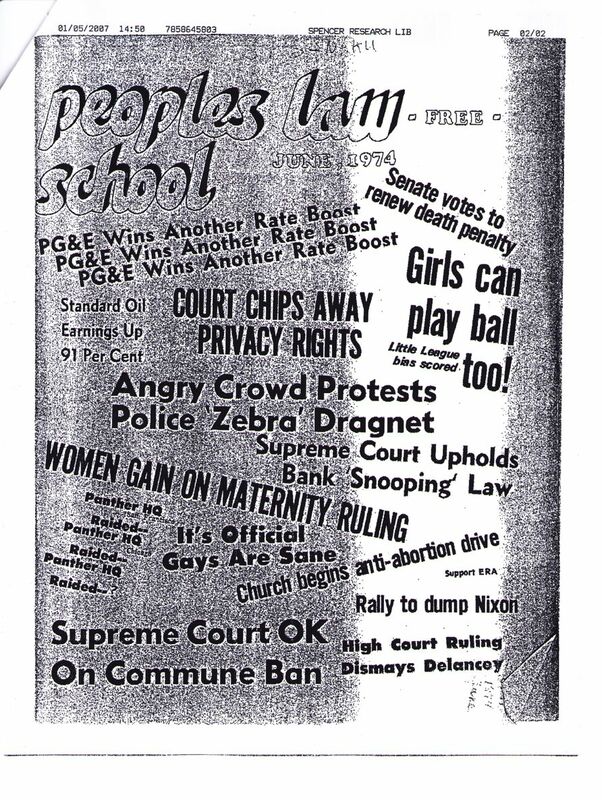 Above: the cover of the June 1974 newsletter of the (now-defunct) People’s Law School in San Francisco. That “People’s Law School” was supposedly the inspiration for the Vancouver-based People’s Law School. Click on the image to enlarge it. Yesterday I introduced what I call the “update problem” of PLE: when law changes, somebody has to update all of the PLE materials about that law and try to prevent the public from relying on any outdated materials. There are two kinds of “update problem”: the “anytime” PLE kind (pamphlets, booklets, videos, websites, and so on—content that the public can use “anytime”) and the “one-time” PLE kind (workshops, classes, and trainings that happen at a specific time). I talked about the anytime kind yesterday. The one-time PLE update problem is the anytime problem exploded into abstraction. Although all knowledge evolves over time (consider history, science, English, and geography), the law is unstable by design. Similar fields like public health education, civic education, and human rights education all deal with content that’s less fluid than PLE. In modern democratic societies like the US and Canada, the law is a current event; and you can’t teach the news with a year-old newspaper. So, although one-time PLE does not “linger” in the same way a pamphlet does (obsolete on a rack or, worse, in someone’s desk drawer), one-time PLE lingers just as much. The update problem of one time PLE draws our attention to the basic update problem of all PLE: I keep what I learn from PLE with me, and pass it on to others, until you teach me what’s new. In this way, the anytime PLE update problem is a simpler, practical problem of how to keep the public away from out-of-date material. The one-time PLE update problem is a complex, fundamental problem of how to teach a subject that changes constantly. Thus, solutions to the one-time PLE update problem would be solutions to the anytime problem, too. But how can we address the one-time PLE update problem? By tracking users? PLE groups could make an extra effort to keep in touch with those who attend classes and take materials. The web and email make this approach more and more possible. By teaching habits, not just substance? Maybe all PLE events should start with a non-boilerplate lesson on how to use legal information (like this one [link] from US for-profit PLE provider Nolo Press). Surely some of the education academics and professionals out there have some thoughts on this. I’m certain, in fact, that there must be whole bodies of literature on this—can anyone direct me to it? Nearly all PLE programming has to deal with what I’ve come to call “the update problem. The law is always changing, and PLE program content that doesn’t change with it can be much more harmful than helpful. This problem distinguishes PLE from the other side of legal services delivery, casework, where legal advice is tailored for a specific person with a specific issue at a specific time. But in PLE, legal information (and training) cannot be so specifically tailored; PLE is a one-size-fits-many strategy. Anytime PLE: the PLE content that’s recorded—in text, video, audio, photo, and so on—and shared with the public, who can refer to it anytime they want. These are the pamphlets, booklets, web pages, and videos of PLE. One-time PLE: the PLE that involves live talking, showing, and doing. That is, the lectures, classes, workshops, webinars, radio shows, and phone hotlines of PLE. The web! Putting PLE content on the web means you can update it continuously. Éducaloi is an example of an organization that has focused its PLE delivery on the web, and it is able to update its information simultaneously with changes in the law. Discard notices. Using a recall approach, you can put a system in place for letting the world know when your PLE materials have gone bad. Community Legal Education Ontario (CLEO) uses this approach, and their current “Discard List” is available online [459 KB PDF]. Supplements. Another approach is to add inserts to your existing materials that notify a reader of changes in the law and which parts of your pamphlet are affected. This is the way most legal publishers (for lawyers) operate—issuing a monthly or annual “pocket part” that contains every change in the law since the last supplement. “Born on” dates. Probably the least expensive solution is to just print the publication date prominently on all materials and leave it at that. Accompanying this “born on” date with a warning that the law can change on short notice makes these notices more helpful. Many PLE providers, both sole-purpose and non-, follow this approach. After condensing what I’ve learned on the road, I’d say that these five ideas are about all that’s out there on the “anytime” PLE update problem. Also, it’s worth noting that I haven’t found any research on how bad the problem of out-of-date PLE actually is. How often are people using obsolete materials? And how big of a mess are they getting into because of it? I was out of the country for the second half of last week. Although I meant to warn of this before I left, I was recording podcast interviews up until the very minute that I had to leave for the airport. Regular posting resumes today, and new podcasts should be appearing soon. Do you have a favorite PLE quote that you’d like to add to the list? Suggest it in a comment or email me.